The Study of Metal Structures and Their Mechanical Properties focuses on metal structures and their mechanical properties. Topics covered range from the crystalline state of metal structures to lattice geometry and crystal symmetry, along with dislocations and lattice faults. Electrons in metals are also discussed, along with alloys and dispersions. Comprised of 13 chapters, this book begins with an introduction to networks of points in space, or "space lattices", followed by a detailed account of the geometry of crystal lattices and the symmetry of crystals. 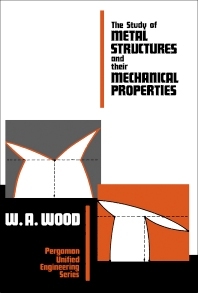 Subsequent chapters focus on electrons in metals; alloys and dispersions; lattice faults; some properties of dislocations; and elastic strain and internal stress. Some basic techniques are purposely illustrated by simple but significant applications. The unidirectional plastic strain and static strength displayed by a single-phase metal at normal temperature are examined, together with the basic processes of cyclic strain and fatigue strength. The final three chapters deal with combined unidirectional and cyclic strain; deformation at elevated temperatures and creep strength; and the problem of developing economic material with small plasticity that is small enough to permit high strength but large enough to damp any sudden crack growth. This monograph will be of interest to undergraduates who plan a serious study of material science and to established engineers who still like to think about how things work.